In 1942, after the attack on Pearl Harbor, the American government became worried about what would happen if Japan invaded Hawaii. Specifically, officials were concerned about all of the U.S. money on the islands. If the Imperial Army invaded and grabbed all the cash, how could the government flag or demonetize those bills? After all, the money would be indistinguishable from all the other U.S. money in circulation. 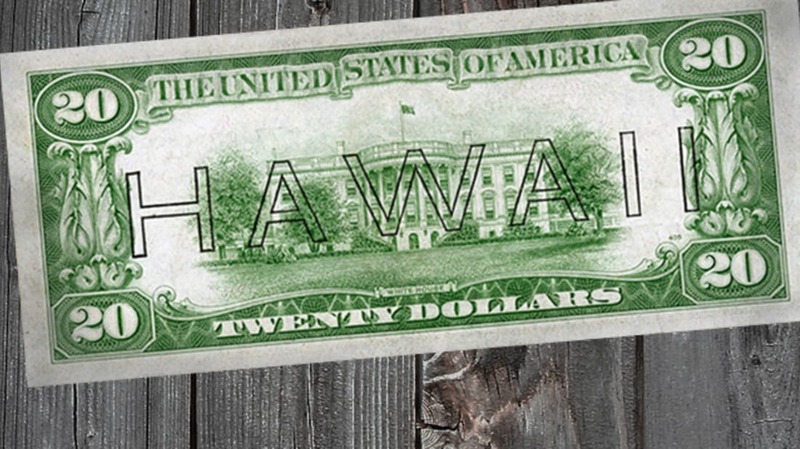 To hedge against that situation, the government did something unusual: they recalled all of the paper money in the territory, asking the people and businesses to trade in their money for freshly printed bills that looked fairly standard except for the word “Hawaii” stamped across them. The US government also issued strict rules about how much money anyone in Hawaii could carry: individuals could have no more than $200 in cash, while businesses were capped at $500. But what about all the money they’d just collected in the recall—the $200 million of regular currency rounded up on the islands? Instead of putting it into circulation, or stockpiling it somewhere, the government decided the simplest solution was simply to burn it. Of course, this ended up being its own hassle. According to The Numismatist, officials started by trying to incinerate the massive piles of money at a crematorium in Honolulu. But when they couldn’t burn the cash fast enough, they had to commandeer some furnaces at a sugar mill in Oahu to get the job done. By October of 1944, the U.S. no longer felt the threat from Japan, and they took the emergency bills out of circulation, allowing normal currency to re-enter Hawaii. The treasury took some of the overprint bills out of circulation and pushed some of them to other islands in the Pacific. Today, very few of the Hawaii bills are still in circulation, but if you find one, hold on to it! A $20 bill from the era will fetch roughly $4000 in today’s money.